This step-by-step tutorial explains how you can easily rip and upload DVD videos to online sites like YouTube, Facebook, etc. If there’s a party happening at your home, you’ll probably capture the moment on a Flip video camera and then upload it straight to Facebook or YouTube so that all the other family members may also enjoy it. But things were a bit different few years ago. Back then, you would shoot everything with an analog video camera on tapes and burn them on to DVDs. Therefore, in all these years, your high school reunion, your wedding video and dozens of other DVDs have piled up in the cupboard waiting to be seen. Step 1: Get the video from DVD to your hard drive. 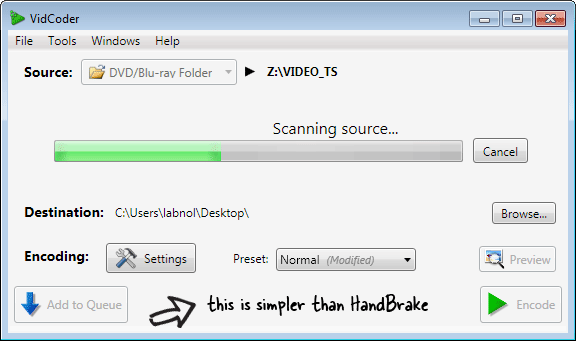 While HandBrake is one of the most popular tools for extracting videos from DVD images, I recommend VidCoder which is more like a simplified version of HandBrake. Run VidCoder, insert the DVD disk and then choose the VIDEO_TS folder of your DVD drive as the Source in VidCoder. Step 2: Let the conversion begin. While you are in VidCoder, Press Ctrl + T or choose File – > Enque Multiple Titles and add all the titles to the queue for conversion. The default conversion settings* are good enough for online video so we don’t really need to modify the Encoding part. Just hit the “Encode” button to start the conversion process. This might take some time depending upon your computer’s processing power as well the duration of the DVD video. Step 3: Make it YouTube ready. YouTube won’t accept videos that are longer than 15 minutes and we therefore need to split our DVD video clips into multiple smaller parts to fit the YouTube limit. There’s a nice Windows-only utility called MP4Box that can help you here. If you have two video clips of 20 minutes each and you split them at the 00:15:00 mark, you’ll actually end up with four clips – two of 15 minutes each while the other two of 5 minutes each. To prevent such a situation, a better solution would be that you first combine the two clips into one and then split them at 15 minutes. Launch MP4Box GUI, click the Join tab and add all the DVD parts in the right sequence. Join them all and save the file. Next go to the Split tab, open the same “joined” file and choose “Split by Duration” – set the the value to 15. Split. We are now ready to put our videos to YouTube. The regular upload tool on YouTube works pretty well but I suggest using the Java based tool since it supports resumable video uploads. Click the “Upload Video” on YouTube, press the Shift button and select all the 15 minute long clips in one go. Take a break here because uploading will take time. Now that your entire DVD image is on YouTube but in parts, it’s important that you link all these parts so that people may enjoy them all in a sequence. This is possible through the video annotations feature of YouTube. Open the first video clip in the YouTube Annotations editor, scroll to the end and insert a speech bubble that points to your second video clip. Repeat this with all the other clips. Annotations involve a little effort so a good alternative is playlists. Put the all DVD parts in one YouTube playlist and then advantage here is that your friends can watch everything from one page without having to manually navigate through videos. [*] Unlike commercial DVDs that are copy protected, home DVDs are generally unprotected meaning your can easily rip them into other video formats without requiring any workarounds.